This is an odd photo for my blog. 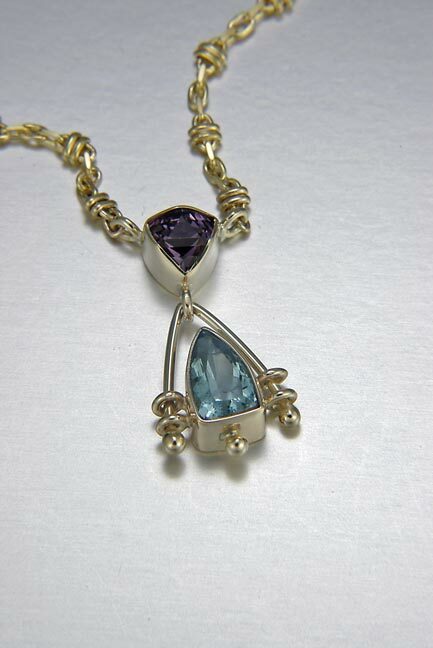 It’s a work of art, unusual gemstones in a unique pendant, hand made by me. In my first career, I was a goldsmith. For over 30 years, I created one-of-a-kind fine art jewelry in my gallery/studio, just after an early morning trip to work my horses at their boarding barn. Then I had a monumental, death-defying mid-life crisis that landed me on this farm in 1999. It’s been the best thing; now I train horses and riders a combination of dressage and natural horsemanship full time. Each of my senses is required, consistency and spontaneity are the rule. My art is in collaboration with horses. It’s infinitely more creative work. WordPress Photo Challenge is a weekly prompt to share a photo- I enjoy twisting these macro prompts to share our micro life here on the Colorado prairie. This photo by Azad. ← Getting Happy About What You Don’t Know. The pendant is beautiful… and so is what you do with horses and riders… the patience and understanding you put in to us is amazing! I still love your jewelry! The animal photos and blogs are a delight. Thanks for sticking with me, Kari. What a gorgeous pendant! So much fun to see another side of you.